Instead of the adoption of any manual or mechanical dot measuring device, more and more factory workers and engineers would prefer to choose laser tech applied dot aligning device. 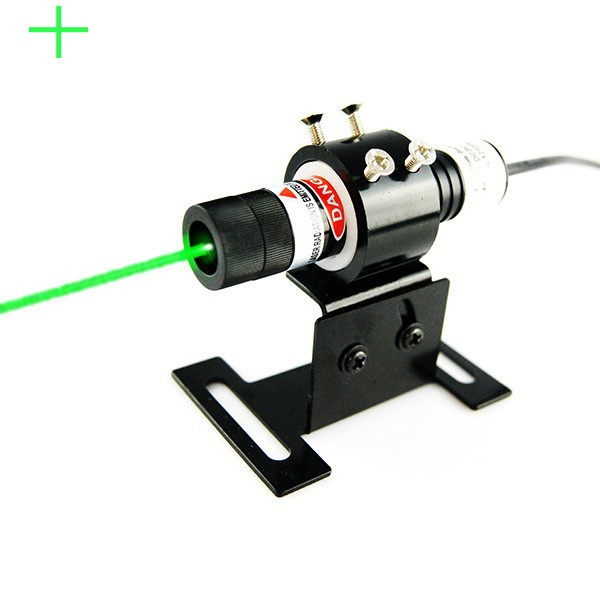 When high power 532nm 200mW green dot laser alignment tool is applied, it is just generating the most easily absorbed and the brightest green laser light source from beam aperture, and then obtain extremely accurate and the most compact size green reference dot in distance effectively. Anytime users are making very easy adjustment of laser beam focus and green dot targeting direction to correct position, it will be effective enough to make the clearest dot indication in distance and high lighting effectively. When high power 532nm 200mW green dot laser alignment is comparing with those formal laser dot aligning device, it is not just limited within maximum output power of 100mW, but just generating extremely powerful and visible green light at even longer distance. In order to get quite laser beam transmittance in constant dot aligning use, this laser diode module is being made with excellent glass coated lens. When green reference dot is pointed at quite long distance, there is still no appearance of laser light decay or blur, but still workable with highly clear dot generation in distance easily. In order to make sure of highly clear dot positioning result constantly, high power 200mW green dot laser alignment is designed with high attention to environmental stabilization. The adopting of separate metal heat sink cooling system is obtaining superior thermal emitting than formal inner cooling system. Equipped with aircraft used aluminum alloy housing design, this high power 532nm green laser module gets the best thermal conductivity and up to 80% laser beam stability under formal use by skilled user or professionals. After quite easy installation and adjustment, it is beginning to work with the clearest dot generation on any targeting surface. It is always taking the lowest time consumption to make clear dot projection and also getting recued relying on professional skills. 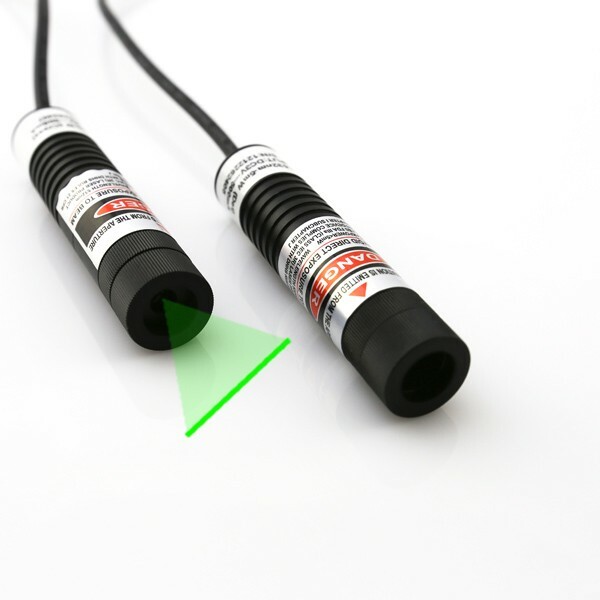 In occasion that dot alignment is processed in multiple working occasions, high power green laser dot alignment is designed with extending electric wires for both tube tail and DC power supply, which is formally installed easily within 0.3 meter to 3 meters, and then obtaining the most convenient dot generation on any vertical or horizontal surfaces effectively. Anytime highly powerful green light and thermal energy are produced from beam aperture, users should always avoid eye exposure and wear 532nm wavelength preventing laser safety glasses so as to reduced hurt to human eyes and skins, and then achieving highly secured dot alignment perfectly. When you are trying to make super clear and high speed dot measuring work on different targeting surfaces, I would have to recommend users high power 200mW green dot laser alignment. It is an industrial stabilized dot measuring device. 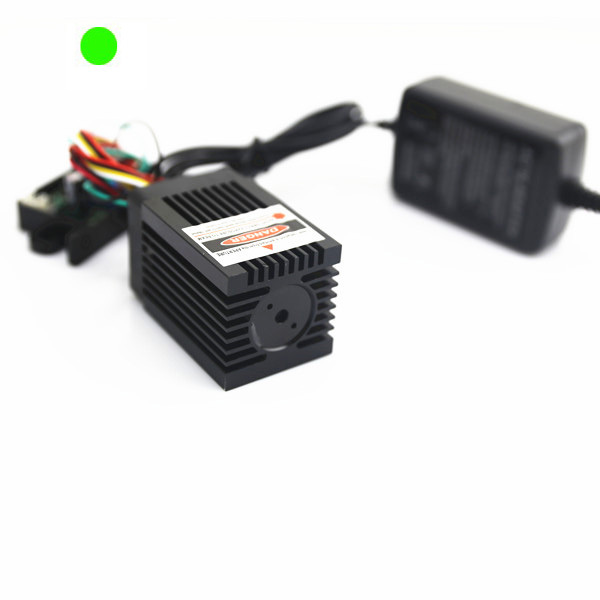 Owing to its excellent design with thermal emitting system and constant electric power source from DC input power supply, this 532nm green laser module is able to work with continuous dot generation in constant work. 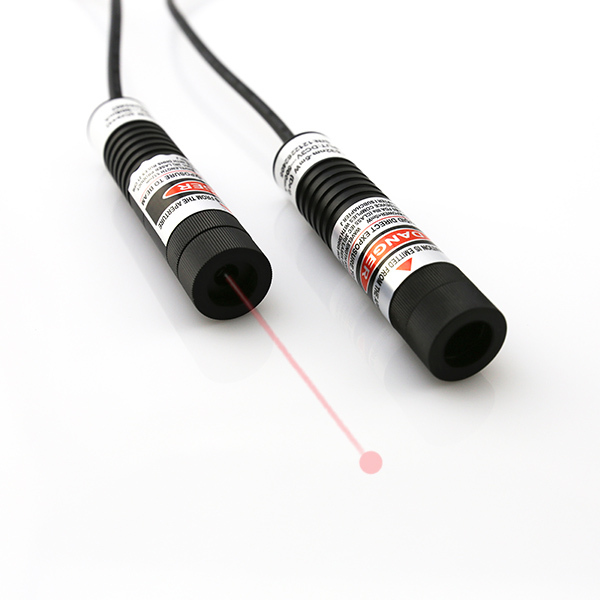 On basis of quite easy installation within wide range distance of 0.3 meter to 3 meters, this laser dot measuring tool would always make sure of highly clear dot generation in distance efficiently. From the very beginning design with high power 200mW green dot laser alignment, it is adopting aluminum alloy housing tube, which is always keeping super high thermal conductivity. Owing to the special design with separate metal heat sink part, this compact structure made laser diode module gets enough space reserving as its cooling system, and then preventing highly intense thermal energy produced from laser beam aperture. Usually this alignment laser is bearing daily operating time of 8 to 10 hours. When there is leaving enough time for laser module tube cooling down, it is just getting reduced possibility of laser diode and electric driving circuit board burning out or damage, and then maintaining excellent highly stable dot alignment in continuous work. In process of quite clear dot generation in distance, high power 200mW green dot laser alignment is adopting excellent quality glass coated lens. It is always keeping super high laser beam transmittance, and then maintaining highly clear dot projection in use. 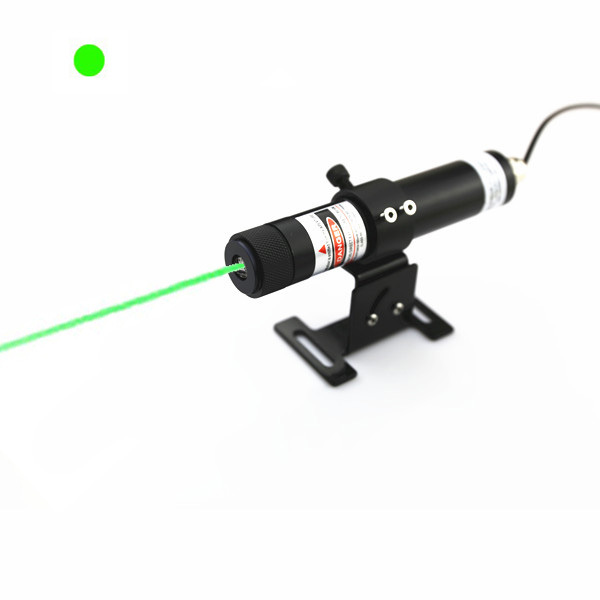 It is a strictly tested green laser module device. Before it is available on the market, it is passing through strict tests up to 24 hours aging preventing, alternative high and low temperature changing test and rapid electric current adding test. Only if the genuine green laser dot targeting is processed by skilled users and professionals, it is able to work with highly stable dot generation in all occasions. Available with quite special extending electric wires designed for high power green laser dot alignment and DC input power supply, it is not only getting easy installation within 0.3 meter to 3 meters, but also keeping highly stable dot aligning performance under high temperature and corrosion. 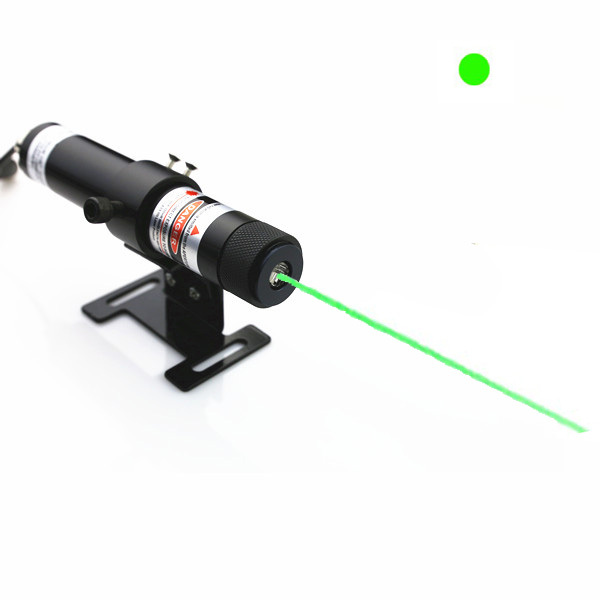 This intense beam alignment laser generate super rapid green reference dot targeting on any working surface, without any barrier caused by long distance, high height and complex working occasion etc. In process of constant dot measuring work, users should take laser safety measure and wear 532nm wavelength preventing laser safety glasses, and then obtaining free dot aligning result perfectly. Whatever kind of industrial and high tech dot aligning work fields, it is just a full of challenge job for user to obtain extremely accurate dot alignment result at quite long work distance. However, laser tech engineer has just paid high attention to the development of advanced 532nm green DPSS laser system, when it is designed with extending space reserving as its cooling system. In process of continuous dot alignment work, this green laser device is maintaining excellent laser light cycling use, and then achieving highly stable dot alignment for all high tech and machinery processing works perfectly. On basis of selected high power of 200mW, comparing with formal green laser device, it is generating even more visible green laser beam, which is also emitting even more thermal energy in continuous dot alignment work. This high power green laser diode module is being made with special thermal emitting system. The separate metal heat sink cooling system has just assured even larger space reserving for thermal stabilization. It is reaching as high as 80% laser beam stability under continuous green reference dot aligning work. In order to achieve highly clear dot generation all the time, high power green laser diode module is employing quite high quality glass coated lens. Besides its operation under long distance, it is also workable with highly clear dot generation under high lighting working occasion etc. It is keeping high laser beam transmittance, and then fulfilling extremely clear dot generation at quite long distance. In order to achieve nice laser light cycling use, before this alignment laser is available on the market, it is passing through a series of strict laser beam stability tests of more than 24 hours. It is getting super strong aging preventing, which is able to work with super long serving lifetime under operation by skilled users and professionals. When high power green laser diode module gets constant electric power source, it will make sure of continuous green reference dot projection easily. In process of constant dot alignment, there will produce super strong thermal energy in use. However, APC, ACC driving circuit board is providing efficient preventing of electric current impacting, and then assuring highly stable dot generation in proper use. Within daily operating time of 8 to 10 hours per day, with enough time leaving for laser module cooling down, it will greatly reduce possibility of laser diode and electric driving circuit burning out or damage. Under operation with special use of 532nm wavelength preventing laser safety glasses, this industrial alignment laser just assures highly secured dot alignment constantly.